Last night I needed to send a slew of SMS messages, and tapping them out on the on-screen keyboard was just not an option I was excited about. I could have grabbed my bluetooth keyboard, or arranged for a Tasker AutoRemote solution, but all that seemed like more hassle then I wanted to bother with. So I busted out AirDroid. If you're not familiar with AirDroid, it's one of those incredibly polished apps that you can't believe they give away for free. At least that's how I think about it. That 'desktop' is actually an interactive access to my phone. I can use it to transfer files, grab photos from the camera, look up contacts, access the clipboard, and yes, send/receive text messages. Actually, it does even more than that. The messaging application is pretty basic, but for hammering out the text messages I needed to send it was perfect. You might be alarmed that I mentioned the URL to access my phone above. Thing is, that URL is on my local network. So unless you're on my WiFi network, you're not getting into my phone. Not only that, but before AirDroid starts in the browser you need to confirm that you wish to allow the connection. This is an especially impressive configuration because the setup (appears to me) to be self contained. You install the app on your phone, and it servers as the server with which to launch your desktop experience. To use the buzzword of the day, in this scenario, you're skipping the Cloud. My messages, contacts, etc. never leave my local network. I find this more of an impressive programming feat than a required security feature, but it works as that too. 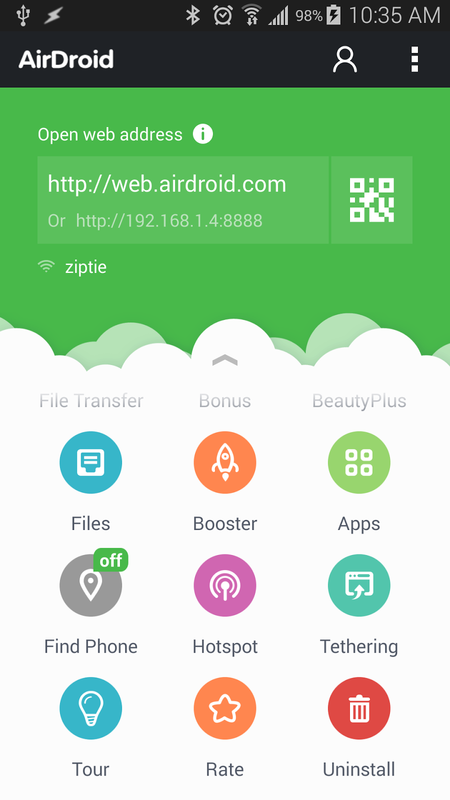 AirDroid also supports skipping this whole local network non-sense, and if you want, you can signup for an account which allows you to access your phone without first being on a specific local network. Whether it's sending text messages, tweaking ring tones, or doing any activity that has you hunched over your phone, you should definitely check out AirDroid. If you're like me, you'll get lucky and be able to complete the same task using a full keyboard and screen.